Right off the bat, the name Clockwork Orchestra makes me think of the phrase a clockwork orange, something ordinary in appearance but robotic in action. 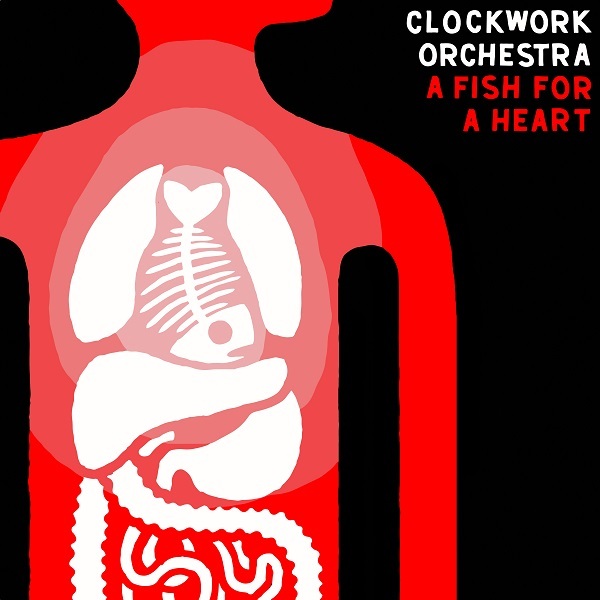 I’m not sure if this really applies here, but A Fish for a Heart, the second release for Paul Mangan aka Clockwork Orchestra, is an incredibly bizarre collection of twelve quirky songs. The opening song, “Generator Girls,” takes you back to the 80s and the Young Marble Giants’ Colossal Youth with its drums, cheesy organ, electronics, and guttural vocals. The music is edgy and mechanical with some intelligent yet off the wall lyrics: “On a bed of nails, cautionary tales are breaking my train of thought.” This album is a complete change of pace from anything being released today. A Fish for a Heart is an infectiously listenable album despite Paul’s bedroom/home studio approach. Each song stands on its own, exhibiting various influences, be it the steam punk/cabaret style of “Puddle Fishing” or the Human League’s “Dance Hall Days” on “Percy.” The childlike simplicity of “Squeak’s Intervention” also evokes comparison to Grandpa Egg on this side of the pond. Other points of reference would be Morgan Fisher’s Hybrid Kids and the French band Ptôse. A thoroughly enjoyable mixed bag of engrossing and at times utterly deranged songs. A Fish for a Heart is a welcome release likely to beguile those of us with a penchant for adventurous music.